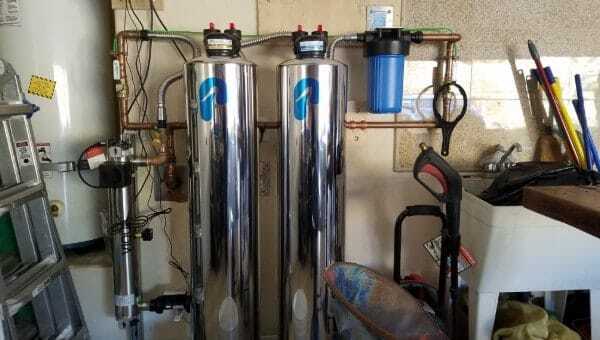 Get a professional water softener installation by Clovis Plumbing Services! Mon - Sat 7 a.m. to 5 p.m.
Offer applies to the purchase and installation of a water softener system. Water softeners replace strong minerals such as calcium and magnesium with softer minerals such as potassium and sodium. Hard water, on the contrary, makes your hair and skin feel dry and brittle. With more than 20 grains of minerals per gallon, Indianapolis is being rated as "hard" water by the Water Quality Association. Water softener installations are considered to have a very strong effect on hard calcium and magnesium. It reduces these minerals which have a high tendency for causing corrosion for water found inside appliances. Soft water can likewise eliminate soap particles and scum which are neglected when cleaning with hard water. Water softeners cost about $1,000.00, yet they can significantly improve the lifespan of your equipment. What is a water conditioner? This is an alternative to sodium and potassium based water softening. Water conditioning uses a completely different system to eliminate or reduce the calcium found in hard water. However conditioners generally do not soften the water as an end result. Select a reputable company that is approved by the Water Quality Association and offers a money back guarantee. Hard water consists of calcium and magnesium which will drain out from the water. White scale forms on faucets, shower doors, etc. However, you need to be aware of the fact that the substance will build up again over time. When the molecules of soap bond with the minerals in water they produce a substance called "scale". This can be seen in shower doors and they tend to leave a film on glassware in the dishwasher. This chemical bonding decreases soap molecules resulting in using more detergent to finish the job. You could also take your own measurements and check for pH level, bacteria, etc. However, even when the levels are lower, you could still see scale forming on shower doors. Water "softeners" make use of negative chemical attraction to grab these positive components out of the water. Generally, this process is accomplished by the use of interconnected negatively-charged plastic beads. Therefore, they are easily displaced by the calcium and magnesium ions which have two positive charges each. The particles stick to the beads, exchanging places with the sodium particles that are taken away by the water. This is the reason why water softeners will "recharge" daily or weekly. Doctors say any amount of sodium in softened water is too small to cause any health issues. If you wish to eliminate all sodium from your diet you should see a health specialist first. Another alternative is to remove the kitchen sink from the softener loop. Bottled water for consumption is another option while the tap water is used for other household activities. Sodium can likewise be removed from the water softener installation by changing to potassium chloride. If you wish to change to potassium chloride pellets rather than salt pellets it's not a big deal. Basically what you need to do use potassium pellets and refill your tank as normal. The primary purpose for doing so would be to get rid of the presence of sodium in your tap water. However, potassium chloride pellets would cost you about three times more for the amount of salt needed. Looking for a whole house water filter? Looking for the Nuvo h20 softener?